Happy Monday! 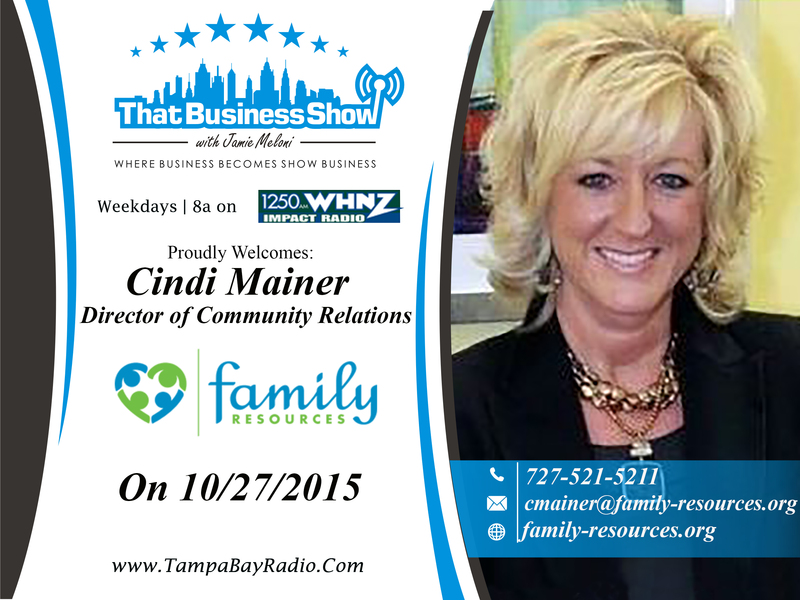 Welcome back to another great morning discussion with Jamie Meloni of #ThatBusinessShow! Remember, the show airs at 7AM to 9AM on #1250WHNZ and www.tampabayradio.com, every weekday! At the show, we are proud to support the Tampa Bay Community. We are proud to invite every business owner to check out the Tampa Bay Business Owners, partners in hand of #ThatBusinessShow. Together, the show and the community provides exposure, education, and a sense of belonging that’s unmatched here in the bay area. If you’re wondering how you can be a part of this, head over to www.tbbo.org to find out more about the community and their latest upcoming events, like the Main Event and the Business Symposium. This year, The Tampa Bay Business Owners will be featuring a Shark Tank panel of experts. Hear from actual people that went in front of the Sharks and how they fared, and all they learned. This day will be jam packed with educational opportunities and will feature 4 breakout sessions. For this unbeatable experience, head over to https://goo.gl/Uy0Ijc to find out more! And if you have seen #ThatBusinessShow and want to be a part of it and get yourself in front of 5,000 listeners every day, then head over to: https://goo.gl/HdDRzt now! This morning, the discussion opened up with Jodi Sherman. Well known and highly experienced in the Tampa Real Estate market, Jodi Sherman of The Griffin Group will ensure that you get the highest and best value for your home. Jodi was originally from New York when she purchased her first vacation home in Tampa Bay 14 years ago. Shortly after became a Tampa resident and has been specializing in Residential Real Estate since. As an investor she has gained an in-depth knowledge of the surrounding communities and the market. She can easily assist her clients, whether they are selling, buying, relocating or seeking an investment property. You can find out more about her and her experience in the #TampaBay Housing Market on today’s 7AM segment at: https://youtu.be/bqkNNmjNZ34! Rachel Revill also joined the discussion at 7AM! Rachel Revill is the CSO, or the “Chief Solutions Officer” and Owner of PerfecTiming Concierge. Since 2004, she has been freeing up time, providing peace of mind, bringing calm order to chaos, increasing productivity… and essentially enhancing her client’s lives. Rachel and her team of personal concierges meet the needs of their busy and demanding lifestyles of their clients. Rachel comments, “Every day is an adventure, I have the best job ever.” In her line of work, Rachel has seen many (many) things. If you’re curious, then you can tune in at: https://youtu.be/bqkNNmjNZ34 on the #ThatBusinessShow YouTube! At 8AM, we were joined by Alex Sanchez and Rita Lowman! Alex Sanchez is the President and Chief Executive Officer of the Florida Bankers Association. Rita Lowman is the Chief Operating Officer of Pilot Bank. This morning, Alex shared with the listeners the mission of the Florida Bankers Association. They spoke about Dodd Frank, and how in their opinions is damaging the banking industry here in Tampa Bay. Alex’s responsibilities include representing and advocating for Florida’s banking industry before all legislative and regulatory bodies in Tallahassee and in Washington, as the Florida Bankers Association is “the leading voice for Florida’s banking industry”. He was nominated by President George Bush and then President Barack Obama to continue his work for the Great State of Florida! Rita Lowman is the Chief Operating Officer for Pilot Bank. Rita began leaving her footprint in the Banking Industry in the mid 70’s. Working tirelessly to champion her colleagues in the banking industry, she is proud that many are now leaders in several banks throughout Florida. With a philosophy to treat associates fairly, give them tools to succeed, and be a positive mentor, she empowers her team to function seamlessly and offer a superior client experience. As an effective teacher, she shares her knowledge, while encouraging input and listening to new ideas. Managing teams of 30 – 1,000 associates, she believes the success of the bank lies within the team. The secret to any good business is the collaboration of its internal teams. And that’s a great piece of #BusinessWisdom! If you wanted to tune in to the show, then head over to: https://goo.gl/0S1dfc now to get involved in the discussion! We had very great guests today, and a lot of fun. Be sure to check us out on the web, and you can find #ThatBusinessShow on Facebook at: https://goo.gl/6LKm8p! Also, if you liked today’s show, why not be part of tomorrows! Head over to: https://goo.gl/HdDRzt to learn how you can get involved! 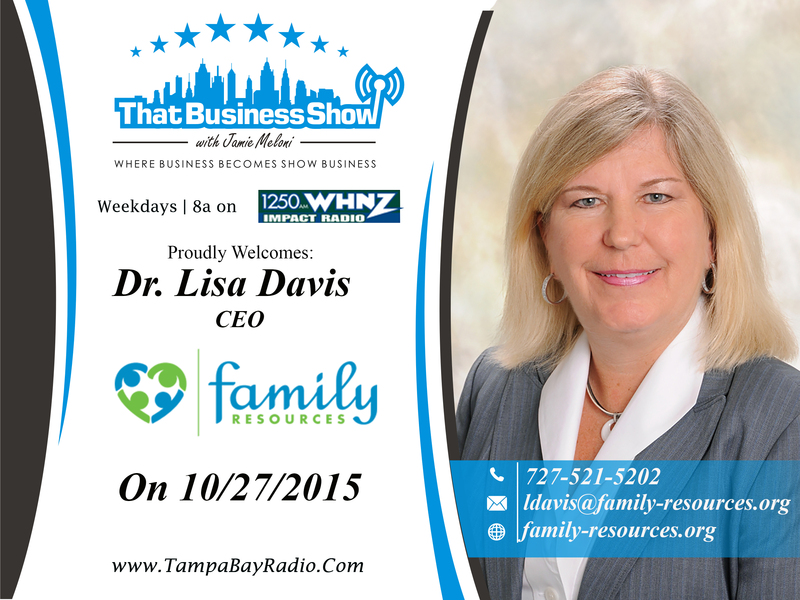 Football and Family Resources on #ThatBusinessShow – Featuring Lisa Davis, Cindi Mainer, and John Gilmore Jr. Welcome to another episode of #ThatBusinessShow, a positive show with a little something different each and every week day, as we bring in professionals and people who advocate for change in our community to come on the #MorningAir and showcase what it is they do! If that sounds interesting to you, feel free to head over to http://www.tampanayradio.com and fill out the contact form to speak to our Producers! Coming on the show today this lovely tuesday morning at 8am on #1250WHNZ was Lisa Davis, CEO of Family Resources, and accompanying her was the Director of Community Relations with Family Resources as well, Cindi Mainer! Tying everything together was John Gilmore Jr, Ex NFL Football player with the Tampa Bay Buccaneers, New Orleans Saints, and The Chicago Bears! Team Player, Team Leader, John is the leader of several companies under Gilmore Brands, becoming quite the Entrepreneur! If you missed today’s guests and the wonderful message that they were spreading, then head over to http://www.tampabayradio.com and go to the show info tab to see our podcasts and streamcasts! Alternatively, you can head to Jamie’s YouTube Channel at http://www.youtube.com/jamiemeloni to watch any of the shows on demand! our first two guests were Lisa Davis, CEO of Family Resources, and accompanying her was the Director of Community Relations for Family Resources as well, Cindi Mainer. Since 1970, Family Resources, Inc. has been the agency to turn to for crisis counseling, safe shelter and respite for runaway and homeless teens. Committed to strengthening families and building better communities by providing prevention, support and counseling to children, teens and families, Family Resources ‪#‎HelpsOurCity‬! Telling us the story of their origins in Clearwater as a helpline, Lisa David and Cindi Mainer had more ambition to actually physically help the young children, homeless mothers, and people in need in the community. Helping people that would otherwise be on their own, Family Resources does such good work for our community, opening shelters for LGBT youth that are abandoned by their families, to expecting young mothers who have nowhere else to turn, helping them to obtain the tools needed to continue education, build professional connections, and to have a chance at succeeding despite their disadvantages. The main mission of Family Resources with any person in need is to connect that person back to a solid tie with a permanent support system to ensure that the person will continue to grow, and we here at #ThatBusinessShow think that’s quite the noble cause. Please consider offering Family Resources your support on their upcoming Celebrity karaoke event which you can find more about at http://www.family-resources.org/. Our next guest on the show was John Gilmore Jr, Ex NFL Football player with the Tampa Bay Buccaneers, New Orleans Saints, and The Chicago Bears! Team Player, Team Leader, John is the leader of several companies under Gilmore Brands. He is also a supporter of Family Resources, helping to organize more celebrity guests for their upcoming Karaoke event. Working together with the Tampa Bay Buccaneers and even crossing the bridge to Baseball with the Tampa Bay Rays, John is helping to make this event something memorable which will help Family Resources immensely, as resources are always needed to help more people become a little more stable in their life, and to be safe. Coupled with his desire to always be more and do more, he found himself following in his father’s entrepreneurial footsteps. Shortly after retiring from the NFL, John became Principal Partner at Encore Select, LLC., a high quality custom framing and memorabilia wholesaler. He then opened up Encore Apparel, and followed again with Encore Promotions to wrap it all up! 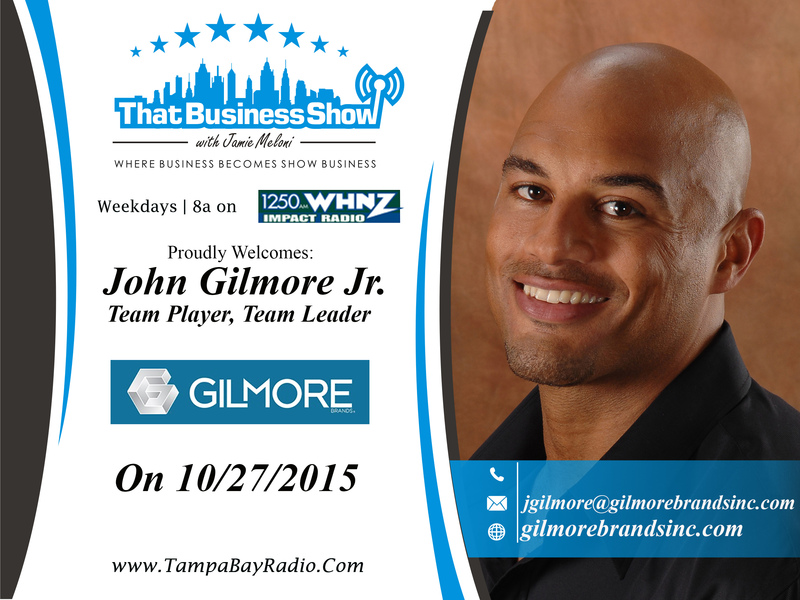 Learn more about John Gilmore Jr. and his success at http://www.gilmorebrandsinc.com! Happy Monday and welcome back to #ThatBusinessShow as we begin this new auspicious week! We had great interviews for the both of our guests here today, and remember – #ThatBusinessShow with your Host, Jamie Meloni is live every day on #1250whnz at 8am. You can also tune into the show at http://www.tampabayradio.com to catch the live stream! Our two excellent guests today were Frank Murphy, former NFL player and now Speaker and Author, and Kelly Woodruff, Business Development Manager with PureLife Medi-Spa. The two are quite passionate about what they do, and we had a wonderful discussion, so if you missed out, you can go check out today’s episode at http://www.tampabayradio.com. Again, thanks for tuning into #ThatBusinessShow on #1250whnz every weekday at 8am as we promote our local community! If you wanted to come onto the show as a guest, head to www.tampabayradio.com and drop us a line! 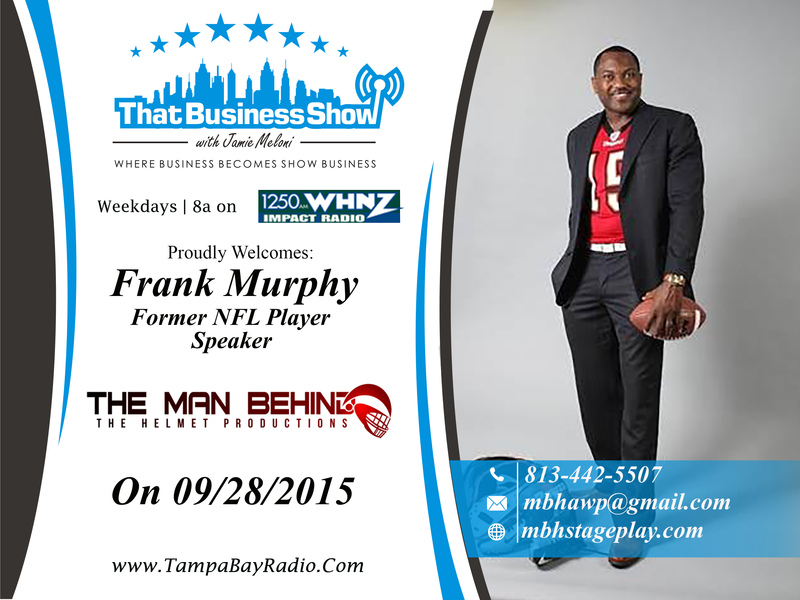 Our first guest on today’s episode of #ThatBusinessShow was Frank Murphy, Former running back, wide receiver and return specialist for the Tampa Bay Buccaneers, Miami Dolphins and Houston Texans. Frank now spends his time mentoring the youth in our community on how to deal with bullying and pressure from bad influences. Mentoring athletes in football, he is creating a new culture of role models to enter the sports arena as leaders and not followers. As an Author and Producer, he wrote a play, “The Man Behind the Helmet’. The play starts a five-city tour on Oct. 3 at 6 p.m. in Tampa, at the Don Thompson Theater on North Boulevard. Other stops include Atlanta, Miami, Jacksonville and Houston. Learn more about Frank Murphy and his illustrious career and his upcoming ventures at http://www.mbhstageplay.com or email him at mbhawp@gmail.com! 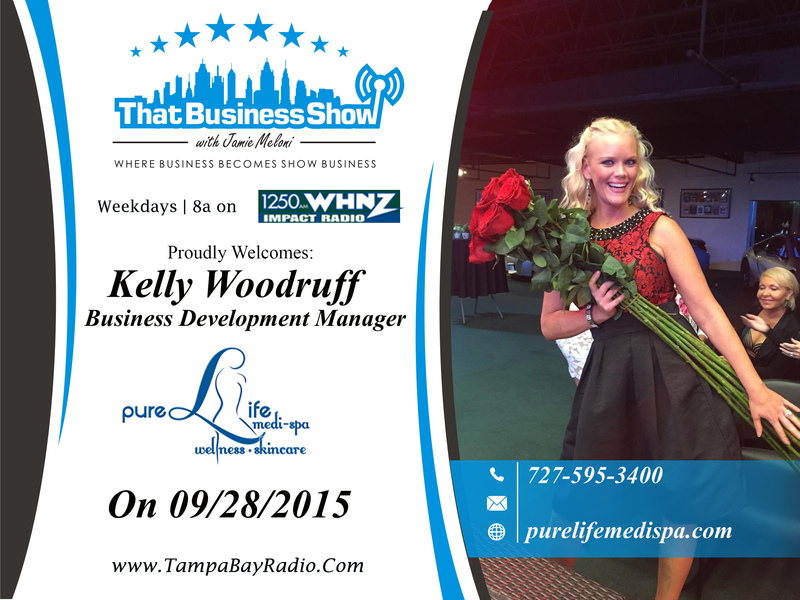 Our next guest was kelly Woodruff, Business Development Manager with PureLife Medi-Spa. PureLife Medi-spa was founded by G. Joseph Fitzgerald, Jr., DO, who was actually on #ThatBusinessShow as well! They specialize in what they call “youth maintenance”, rather than “anti-aging” procedures. They offer a large range of services ranging from non-surgical cosmetic procedures to decadent facials. They also specialize in the newly popular cool sculpting procedure, which can literally freeze fat cells off and help a person lose inches on their figure! Jamie and Kelly spoke about this procedure, which you’ll certainly be hearing more about soon! They have a new MINICOOL tool which will soon allow people to reach even more sensitive areas like under the neck for that troublesome hard to lose fat! To introduce these new systems, they are offering an introductory pricing of 25%off. So make sure to check out PureLife Medi-Spa at http://www.purelifemedispa.com! As always, thank you for tuning into #ThatBusinessShow with Jamie Meloni on #1250whnz, weekdays at 8am. If you missed today’s show, you can always visit my website and see all of our shows on demand athttp://www.tampabayradio.com or visit my YouTube channel.